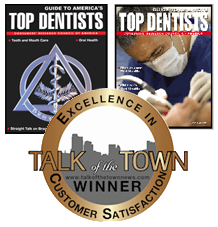 Dr. Renee Yurovsky has been chosen two times as one of America's Top Dentists by the Consumers Research Council of America and has been awarded the CMUS Talk of the Town Award for Excellence in Consumer Satisfaction. When you have dental problems, you need to turn to a dentist who listens and responds; an experienced doctor who knows the field and can effectively diagnose your needs; a friendly dentist who counsels you on how to maintain good oral health. Dr. Yurovsky and her staff of professionals meet all of these criteria. From general dental care to smile makeovers and even full mouth reconstruction, the doctor handles your needs with complete care, up-to-date knowledge, and experienced hands. At the center city Dental Office of Dr. Renee Yurovsky, we have earned a reputation for skill, comprehensive services and helping put attractive smiles on the faces of thousands of Philadelphians. Here at the center city Philadelphia Dental Office of Dr. Renee Yurovsky, our doctor and her staff strive to provide the highest quality of service and best dental care possible for every one of our patients. Whatever the procedure, whether you need to get a tooth Extracted or have your Teeth Whitened, you are guaranteed to feel at ease here, both with our expert dentist and with her hardworking staff. They are fully experienced in a wide range of dental services, both cosmetic and general, from Partial & Full Dentures to Root Canals, from Dental Crowns to TMJ & TMD Treatment, from Teeth Whitening and Bleaching to Inlays and Onlays, and more. Our mission is to make sure our patients receive unmatched care and results when using our services. When it comes to the dental care of you and your family, there should not be any reason why you should dread the thought of going in for a checkup, or feel that your appointment is impersonal and rushed. Instead, you should feel secure in knowing that your dentist is going to cater to your unique dental needs and provide you with quality patient care. As you browse through the various pages on this site, you will learn important information, which will help you to learn more about what Dr. Renee Yurovsky’s office is capable of doing for you and your teeth. At the same time, you will also have the opportunity to become familiar with some of the basic concepts involved with General Dentistry and Preventative Care. With this information, you will have the power to ensure that your smile stays healthy, bright, and strong after you have left our office. Dr. Yurovsky does not expect you to be completely calm, nor totally carefree when coming into her dental office. She understands that going to the dentist can be a very nerve-wracking process, so it is only natural to experience some degree of anxiety, which varies with each individual. However, you can relax with the knowledge that she and her staff are committed to your comfort and well-being, and therefore will do everything in their power to make sure your teeth are taken care of, and your worries are put to rest. Come to the Center City Philadelphia Dental Office of Dr. Renee Yurovsky, and you can be certain that you will experience high-quality dental care, and customer service committed to your comfort and convenience with every visit. Our office offers full-service dentistry from the finest of professionals and experts in the convenience of one location to provide you with complete continuity of treatment. Our Affordable Dentist and her team are dedicated to providing you a positive experience. Rest assured that you will experience high-quality, personalized care to make your visit as comfortable and pleasant as possible.